This Geiger–Müller Array (or Geiger tube telescope) exploits an effect called Electromagnetic Cascade as a means of significantly increasing the effective aperture of the detector while reducing other issues I've identified in experiments with cosmic ray detection. In a 1964 publication Bruno Rossi first described an experiment where cosmic rays could penetrate dense materials. Finding that cosmic radiation at sea level could penetrate over 1m of lead. In these same experiments he was also surprised to record a higher rate of detection as the thickness of lead increased peaking at 1.5cm and then falling slowly. Consequently using a similar approach it is possible to improve a standard Geiger–Müller Array using a lead block in which the tubes are placed in an area which optimise these effects. 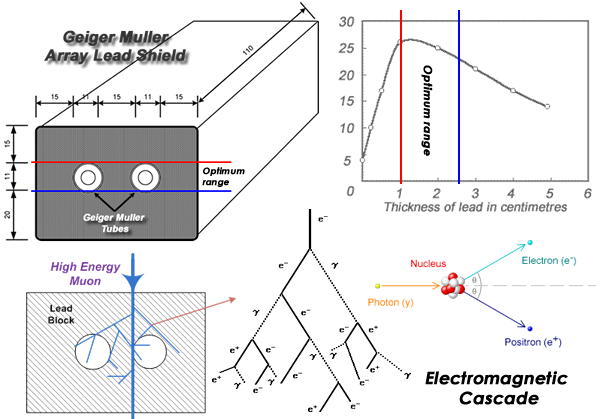 A Muon passing through lead will create electromagnetic cascades where they are detected by Geiger–Müller tubes. The benefit of using this method not only enhances the count rate, but also allows the tubes to be moved into a parallel arrangement doubling the aperture of the detector over a conventional Geiger–Müller Array where the tubes are placed one above the other. While at the same time significantly reducing terrestrial interference with 15mm of lead shielding between each tube. Prototype v1. Cut Lead Block block to size, drill holes, insert tubes and terminate. Worse case terrestrial radiation may have energies up to 1.3 MeV but do not have enough energy to penetrate more than 10mm of lead and also cannot produce Electromagnetic Cascades, where muons created as a result of cosmic rays at sea level still have a mean energy of 4 GeVh or more and so can penetrate a metre of lead easily creating numerous Electromagnetic Cascades as they pass through. Prototype 1. Schematic of a two tube Geiger-Müller Coincidence Detector. Using the circuit above the negative sawtooth pulses from each Geiger–Müller Tube (GMT) is converted into brief 5V square wave signals through a 74HC14 Schmitt Inverter and then further shorted to around 5uS. Unfortunately a Geiger–Müller tube response time to decay (Pulse Width) is relatively long for measuring the probability of coincidence in two or more the tubes. This means the wider the Pulse Width the greater the number of false positives. Consequently some means of pulse shortening is required to shorten the Pulse Width to a shorter period to decrease the probability that it is terrestrial radiation hitting the tubes in close succession. The CRO trace above demonstrates what happens in this circuit when a wider pulse in feed in. The bottom trace is the output and only responds to a negative travelling pulse regardless of pulse shape. This is also important as the Geiger–Müller tube is positively biased and when a particle is detected the output swings negative, so the circuit ensures that only the first 5 micro seconds before entering a 74HC02 NOR gate which acts as a coincidence detector. Only when pulses are detected from both GMTs simultaneously within a 5uS window will there be an output, confirming the presents of an Electromagnetic Cascade within the Lead Block as a result of a high energy particle passing through. 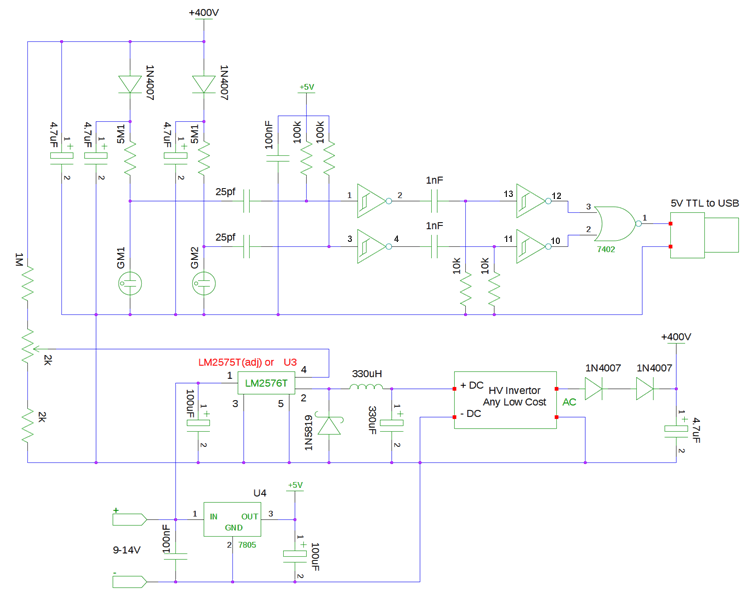 Note that the output of the above circuit uses a 5V TTL to USB PCB this is because they are so cheap and I see no reason to reinvent the wheel, thank you to all Arduino enthusiasts everywhere. This PCB was purchased from Little Bird Electronics. This allows me to link the output to the computer and log the count and even upload a live graph to the website. Unfortunately there aren't any win32 freeware or linux packages around and as I'm not a coder, I purchased a software package called Rad 2.4.5 which allows this and runs on both Win32 and MacOS. Prototype 1. First rough prototype built - still more refinements but basically it works!. I'm using Russian Hard Beta/Gamma sensitive Geiger-Müller tubes which are commonly available on ebay at low cost. I've purchased a few of these and they work quite well for gamma and xray sources. Which is ideal for this experiment as they are insensitive to low energy radiation and detect radiation along the wall of the metal tube.